These days so many food fads are just a “flash in the pan,” so to speak. Grapefruit diets, diets based on the colors of food, diets that limit what you can eat based on your blood type, diets that only allow you to eat at a certain small point in the day…you get the idea. These diets are the new modern panacea, here to solve all your problems and give you energy, make you skinny and more attractive, according to whatever standards you may prefer. The problem with fad diets is that they are hard to commit to, because of the odd restrictions and whatnot. Couple that with the fact that oftentimes these diets do not provide all the nutrition a human body needs, so the animal brain curled up in your head will send overwhelming signals to crave the things the body is starving for. This combination means that fad diets remain just fads and people continue the binge-and-starve cycle as they quest for the Holy Grail of health and happiness. The good news is that the newest “fad” food is anything but. In fact it is one of the oldest cooked foods humans ate at the dawn of culture, right after the discovery of fire. Unless you grew up on Mars you’ve had it, since every single culture on every single continent makes a version of this food and it is very commonly consumed. What is this ancient food, you ask? Yes, bone broth. Also known as just broth or stock, it is the product of cooking bones for a long period of time at moderate heat in order to extract rich flavor and abundant health benefits. Bone broth can be made with fish, poultry, beef, lamb…you name it! Bone broth is the base of most of the soups, stews and sauces enjoyed worldwide. So why has bone broth suddenly come into the limelight as a health food since it is such a ubiquitous thing? Recent studies have proven what grandma already knew when she gave you chicken noodle soup when you were sick. Bone broth is very healing for the gut and a nourishing elixir that is easy to digest by people with delicate systems. In addition, cooking the bones in water for a long period of time leaches out minerals and healthy collagen and glucosamine into the broth, making them easier to consume and a lot more pleasant than gnawing on a bone like a dog! 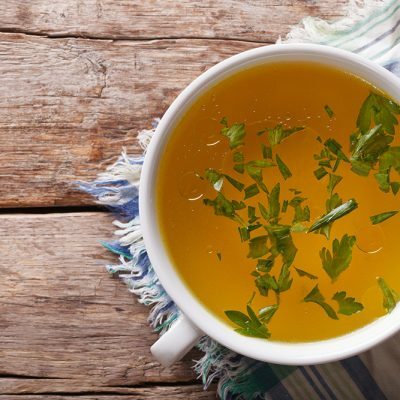 There are many sites online going in depth about the health benefits of broth, so I will leave that research up to you and just say from experience that it really does a body good. Bone broth is easy to find in powdered and liquid forms, but did you know that it is really easy to make? All you need are bones, water and and a crock pot, as well as whatever herbs and spices make you happy. Being a hands-on kind of person, I definitely prefer my broth fresh and being lucky enough to work on a bison farm gives me a good source for healthy, grass-fed bison bones. I make a batch every couple of weeks and sip a hot mug a day, which is an especially nice pick-me-up on these cold and grey winter afternoons. Since I have been doing this daily for my own health and feel great, I will be adding a selection of our healthy, all natural, grass-fed bison bones to our website soon, along with a simple to follow recipe. You will be able to conveniently order bones in five pound bundles, which is just perfect for a batch of broth, and get started on your own culinary adventure toward delicious health!